Global Herbs The Conditioner Capsules are a combination formula which helps to maintain optimum liver function, digestive support and mobility. It is a gentle supplement which helps to keep your dog as healthy as possible by supporting the digestive system with good bacteria; this ensures that harmful chemicals from the digestive system do not seep through the gut lining and damage the rest of the body. 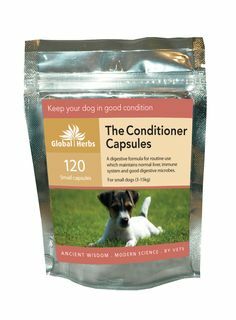 There are currently no questions for Global Herbs The Conditoner Capsules for Dogs - be the first to ask one!